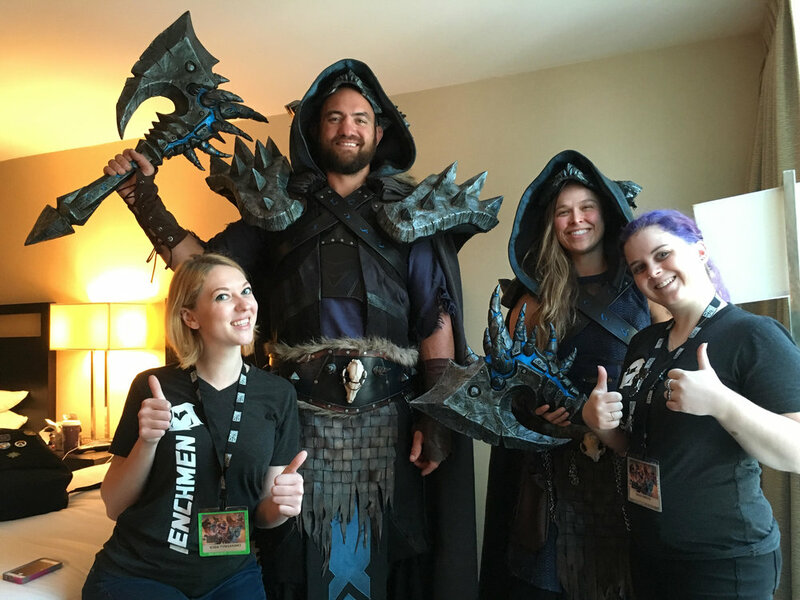 Our Team created two World of Warcraft Death Knight costumes for Blizzard Entertainment to be worn by Ronda Rousey and Travis Browne at BlizzCon 2017. Ronda and Travis wanted to take in the full BlizzCon experience, incognito: visiting the Darkmoon Faire, Hearthstone Tavern and of course playing World of Warcraft. The Death Knight costumes were designed pulling inspiration from various World of Warcraft Death Knight sets as well as traditional Norse clothing. The costume creation included various traditional methods such as hand sculpting and leather crafting. Our team detailed and weathered every layer of the costumes for a cohesive and detailed final design. Even the axes, No’Kaled, were re-interpreted by combining 3D printing and hand sculpting to seamlessly tie in with the final costume design.